The number of veterans experiencing homelessness in the United States has been cut nearly in half since 2010. Yet there are still far too many veterans struggling to find and keep a safe, affordable place to call home. As of January 2016, there were nearly 40,000 veterans experiencing homelessness on a given night. 11% of the total homeless adult population are veterans, and veterans make up 20% of the adult male homeless population. The number of post 9/11 veterans is expected to grow considerably – to more than 3.3 million by 2023. Already this population is cost-burdened and struggling to find affordable housing. One in five post-9/11 veterans is a woman. Women veterans are three to four times more likely than non-veteran women to be homeless. Mission First Housing Group is doing its part to eliminate homelessness among veterans. The Fund for Veterans has provided rental assistance to more than 40 veterans since its inception. With your support, we can even help more veterans in need. Give to Fund for Veterans Click here to make your secure, online donation today. It costs an average of $7,800 a year to provide an affordable one-bedroom apartment to an individual in need. The Fund for Veterans provides rental assistance to bridge the gap between this number and what a veteran can afford to pay. Mission First is committed to helping veterans in need, regardless of their situation. With your support, we can. As part of Mission First’s continuing commitment to veterans, we opened The Whitehall Apartments, a permanent, supportive and affordable housing community for veterans in Chester County, in the summer of 2017. The Whitehall Apartments features 48 affordable apartments for veterans in need as well as the innovative reuse of the historic Whitehall Inn. The Whitehall Apartments and Mission First’s resident services staff ensure that at-risk veterans have the supports they need to remain successfully housed, get back on their feet and live as thriving members of the community. Click here to learn more and support services and amenities at The Whitehall Apartments. Do you have ideas you’d like to discuss? Give us a call! We’d love to work with you. Contact Moira Rooney, Director of Strategic Investment, at (215) 557-8414 x3251. 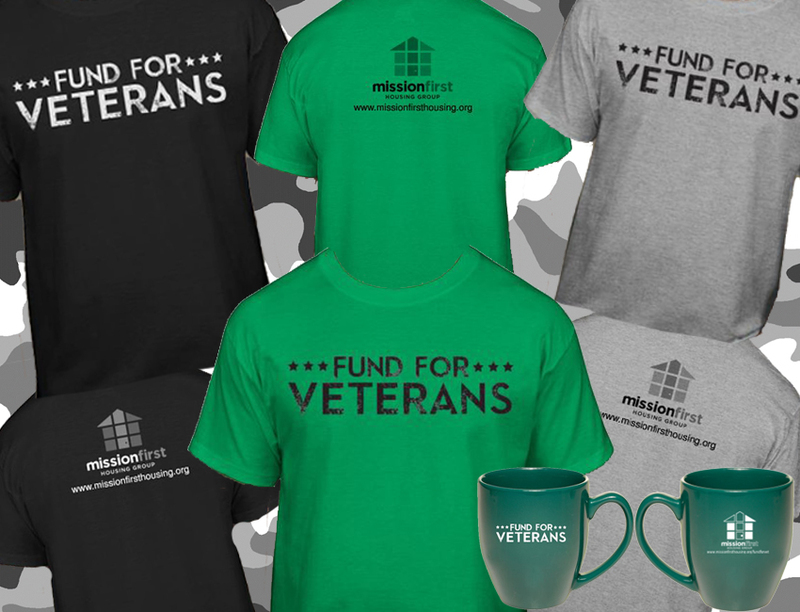 Click here to support the Fund for Veterans by purchasing a t-shirt or mug.